The wizard pupils Elmar, Clarissa and Marlon go to the wizards’ school Abracadabra. Here, lunch isn’t cooked, it is conjured! 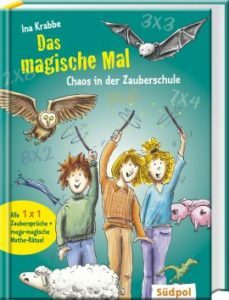 And the lessons don’t cover any trivial things, but broom riding, magic animals and magic spells. 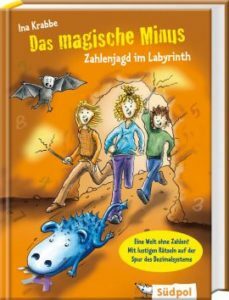 In this environment, the three wizard pupils have to solve tricky (but suitable for children) puzzles surrounding numbers, the times table and geometrical shapes. The playful exposure to math-puzzles will enthuse even math-grouches! The third volume centres on mysterious areas, shapes and figures. 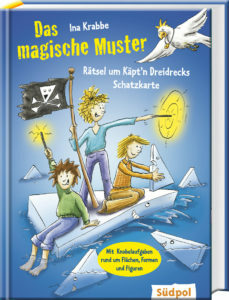 Elmar’s uncle Estragon, a famous wizard, is in possession of Captain Triangle’s bedevilled treasure map and close to solving the mystery of the map. But then Estragon is swallowed by the treasure chart! Elmar, Clarissa and Marlon have to resolve the riddles in order to set the uncle free.